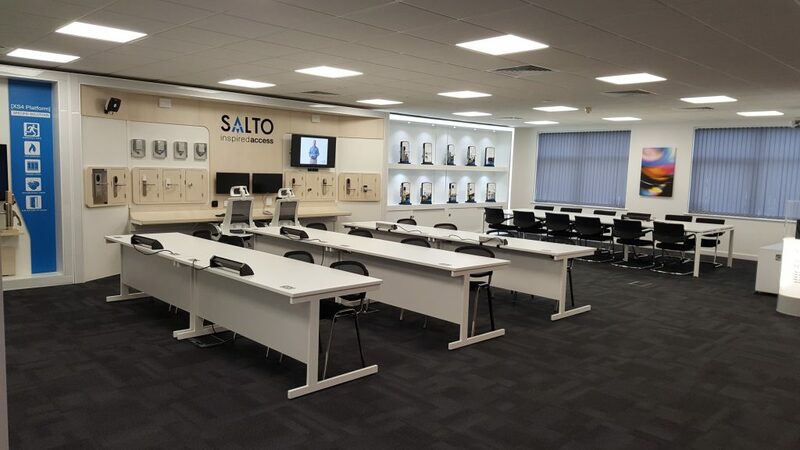 SALTO Systems UK, world leaders in wire free, wireless and cloud based access control solutions, has opened a new training facility at its Southam office to support end users, installers and partners. The modern open plan working space is divided into a number of product themed areas and modelled on that found at SALTO HQ. It provides state-of-the-art resources and demonstrations of SALTO’s latest wireless and wire free products, solutions and technologies and the benefits they offer to UK end-users and installers. SALTO continues to enjoy rapid growth and deliver industry-leading, next-generation electronic locking solutions, redefining the access control world by continually being first to anticipate market needs in a rapidly evolving market place. SALTO UK MD, Ramesh Gurdev, said “We’re excited to provide end users and UK-based partners with this new demonstration and training resource as we continue to deliver the most advanced and flexible electronic locking solutions in the market. “The new facility offers a fully connected space for demonstrations of our extensive product range as well as a place for trainees to work and learn, as well as a work cafe hospitality area offering a relaxed breakout space to relax and enjoy complimentary refreshments.